Protests are met with violence and repression which led to allegedly three people dead. But Chinese civil society seems to become more and more aware about pollution and reclaim the streets. 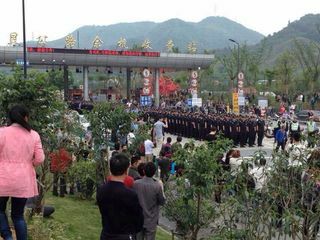 On 11 May, 2014, thousands of people in the city of Hangzhou protested against plans by the local government to build a waste incinerator ; major concerns are related to health impacts. At least 10 residents and 29 police were injured during violent confrontations that resulted in overturned vehicles, as well as the burning of police cars . According to another source, "At least three people are reported dead with dozens more injured, hospitalized and arrested after hundreds of police began a brutal repression with baton beatings, tasers and tear gas, in a move to clear out 1000’s of proposed waste incinerator plant protesters in Hangzhou. Social media accounts are reporting that 2 men and a child were killed by police during the initial crackdown. People report that the incident began with the police attacking the elderly people who were sitting as a barrier to the overpass encampment that has been on site in past weeks" . 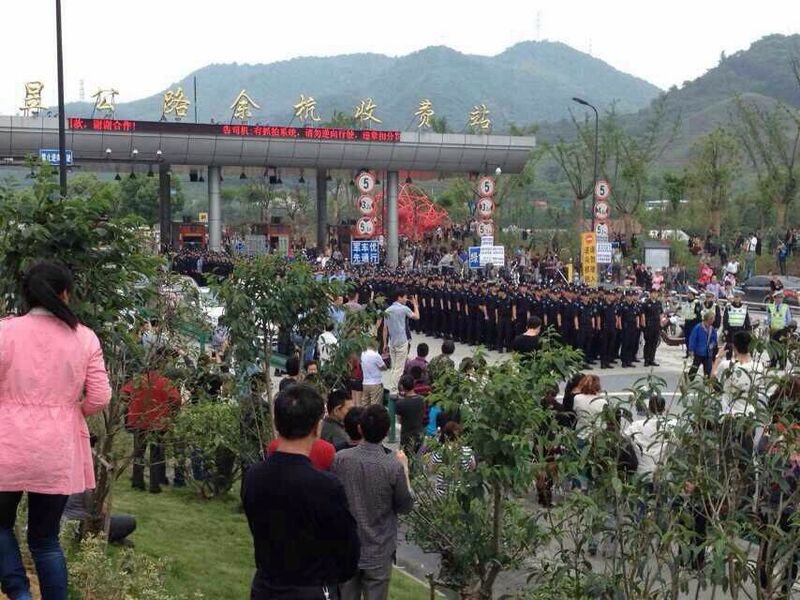 The highway linking Hangzhou and Huizhou was temporarily shut due to a blockade by demonstrators in Yuhang district where the plant is slated to be developed . In a statement issued on the official government website, Yuhang officials promised that work on the incinerator had been halted and that the public would be consulted and invited to participate in decided whether to press ahead with the scheme . We will "invite the local people to participate, fully listen to and seek everyone's opinions, and guarantee people's right to know what is happening and right to participate", it said (ibid). The government also added that it hoped that people would end "maintain normal social public order and jointly maintain social stability" (ibid). Despite the apparent success of the protest in halting the development of the incinerator, demonstrators are being persecuted for their activism by local authorities. Local police posted a list of suspects online and used local television networks to call for the suspects to surrender . The high-profile campaign appears to have paid off, with Xinhua reporting that local police have arrested 60 people for “their violent and rumormongering behavior” during the protests (ibid). According to an article on LibertyVoice , "More Chinese are becoming environmentalists. They not only question governmental policies concerning pollution, they now take to the streets to protests something like an incineration plant being constructed in places such as Hangzhou." Again, as per the news reported by the same article, "Wu Yixiu, head of Greenpeace’s environmental group that confronts toxics in East Asia, said people in China are losing confidence with the way local, district, and national officials handle environmental issues such as the Hangzhou incinerator. In the past, such projects were constructed and the local population had to live with the consequences. There is a growing movement among the Chinese living near such projects who will no longer sacrifice the local environment, their health, the health of their families, and those in the community in the name of progress." However, the question about what to do to dispose waste properly is still open and finds no consent. Project Details 1.09 million tons of waste treated (annual capacity). The incinerator will occupy a total area of 13.97 hectares and process 3,000 tonnes of household garbage every day. Development of Alternatives Xu Wenguang, Communist Party chief of Yuhang district, said construction of the incinerator won’t begin without public support and before going through the legal process, Xinhua said in a separate report today . Xu’s comments reiterate a pledge given by the local government on its website (ibid). Why? Explain briefly. A government in eastern China will shelve plans to build a huge waste incinerator if it does not have popular support, in an apparent victory for protesters who had clashed with police saying they feared the plant would damage their health .